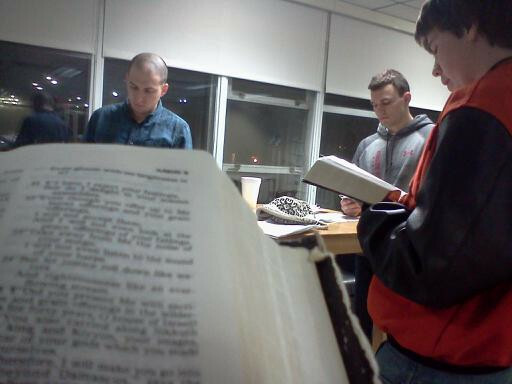 Grace College students are taking a Stand for Freedom today as they pray to end human trafficking. 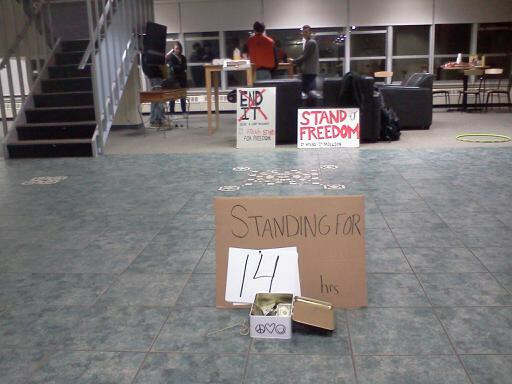 The stand began yesterday afternoon at 4 p.m. in the lobby of Alpha Hall on Grace’s Winona Lake, Ind., campus. It ends at 7 p.m. tonight (March 24). Two GraceConnect/BMH board members, Daron Butler, pastor of cross cultural ministries at the Grace Brethren Church, Wooster, Ohio, and Tim Sprankle, pastor of the Grace Brethren Church, Leesburg, Ind., joined the students early this morning. 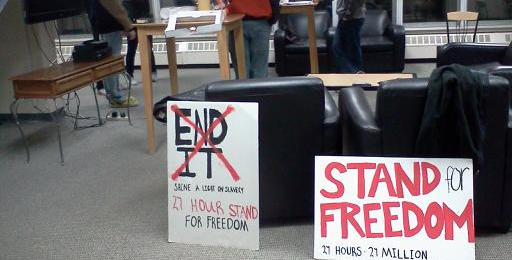 Students at Grace College are hosting a stand against human trafficking starting March 21. The stand begins at 4 p.m and ends March 22 at 7 p.m. They are asking people in the community to rise and stand with them as they fight one of the biggest industries in the world. They have a goal of ten people standing per hour, so they can have a total of 270 people standing. They are asking each person who stands to give $5 toward their goal of $2,700, and to ask people to financially support them as they stand. The event will occur in Alpha Hall lobby and coat room.